Stud and Artificial Insemination Services Available – Please read more below. 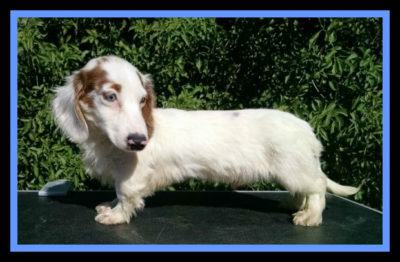 Mr. GUNNER a Miniature Red Double Dapple Extreme Piebald Long Coat, he is stunning! He weighs 9 lbs, has beautiful white flowing hair, one blue eye and is a real sweetheart with a wonderful disposition that gets lots of attention whenever he goes. We absolutely love this little guy. Produces: Dapples, Piebalds, and Solids in; Isabella (fawn), chocolate/tan, cream, red, black/tan, blue/tan. Mr. DASH a Miniature Stunning Red with black overlay Long-Coat, with a great temperament. He weighs 12 lbs, has a very loving personality and gets along great with everyone – especially the girls! We are very happy to have this wonderful little boy as part of our breeding program. Produces: Dapples, Piebalds, Solids in; cream, chocolate/tan, red, black/tan, blue/tan wildboar. Future Dad: This is DIGGER a Miniature Red Smooth Coat. Future Dad: BLUZEE is a Miniature Salted Blue/Tan Long-Hair. He has a dark blue color with tan points, absolutely stunning. Requirements: I provide Stud Service to qualified (AKC), females that have been Vet checked and are healthy and suitable for Breeding. I also require that she have a Brucellosis Test dated within 5 months of mating – MUST be Negative! Here is the reason why. Brucellosis is a contagious disease caused by the small bacterial organism Brucella canis. This bacterium primarily affects the reproductive organs of male and female dogs. Brucellosis can cause infertility and late miscarriages in female dogs. In male dogs, it can cause testicular or scrotal inflammation and infertility. This nasty disease can also cause puppies to be stillborn or very weak at birth. If you would like more information, please contact me at 408-840-1842 (call or text) or email me at Doxbabies@yahoo.com. I also provide Artificial Insemination (AI) services if you have a female or male that is having difficulty mating. 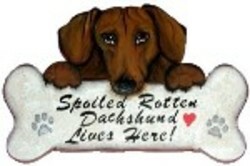 Website, all content, photos Copyright © 2009-2019 Colorful-Dachshunds.com. All Rights Reserved.